Come explore all the diversity of South India from Tamil Nadu to Kerala. 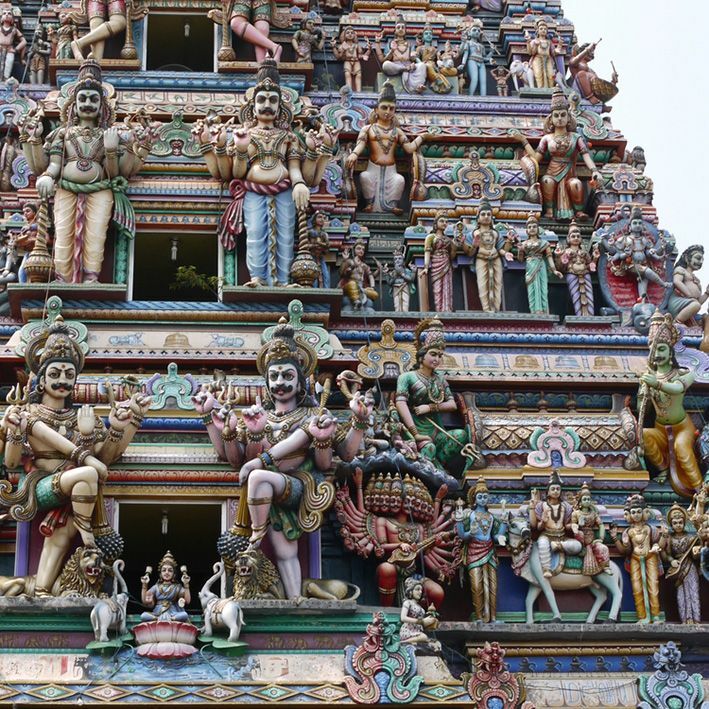 Discover the magnificent and sometimes mystical Hindu temples in the sacred cities of Tamil Nadu. 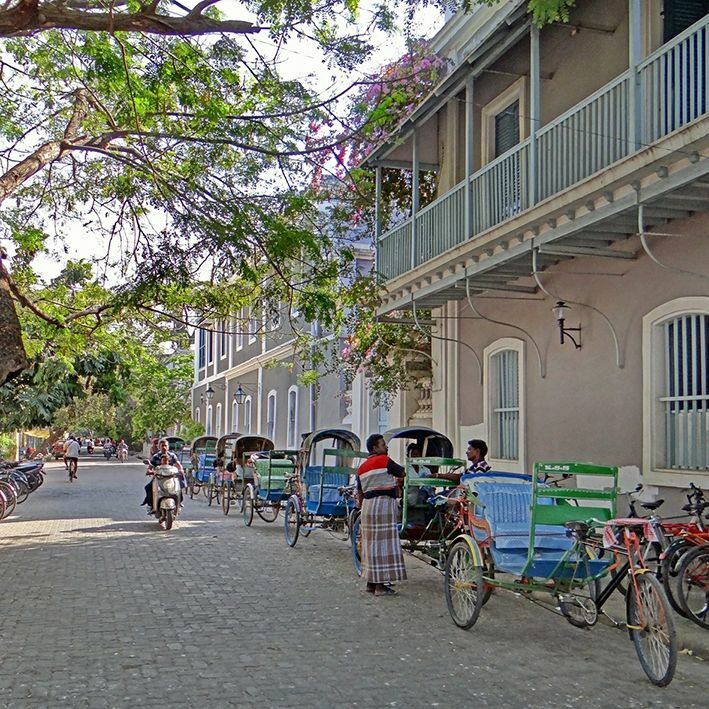 Note the mix of culture in Pondicherry, the charming old French colonial city. 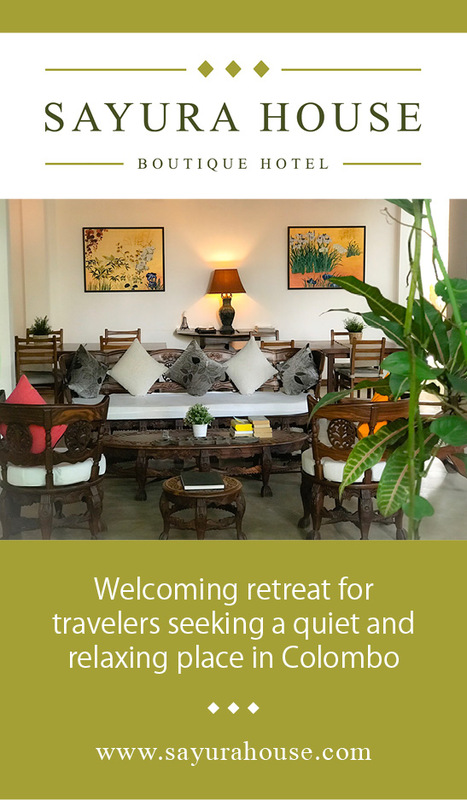 Travel through the Indian countryside before crossing the mountain of western ghats. Explore the tea and spice plantations. 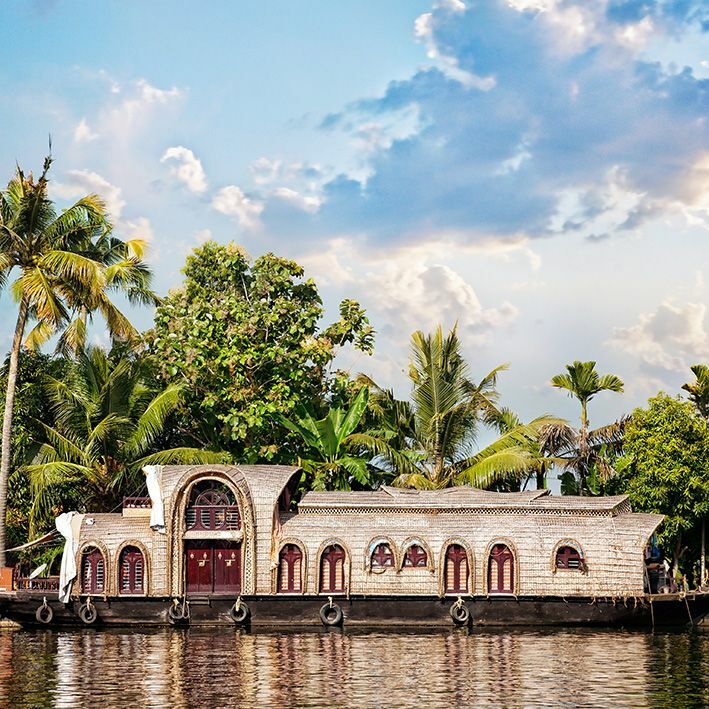 Sail on the Backwaters, these lanes and lagoons lined with jungle and join the Malabar coast in the historic city of Cochin. Marvel at customs, traditional dances and costumes. This rich and varied itinerary will captivate fans of culture and history but also adventurers. 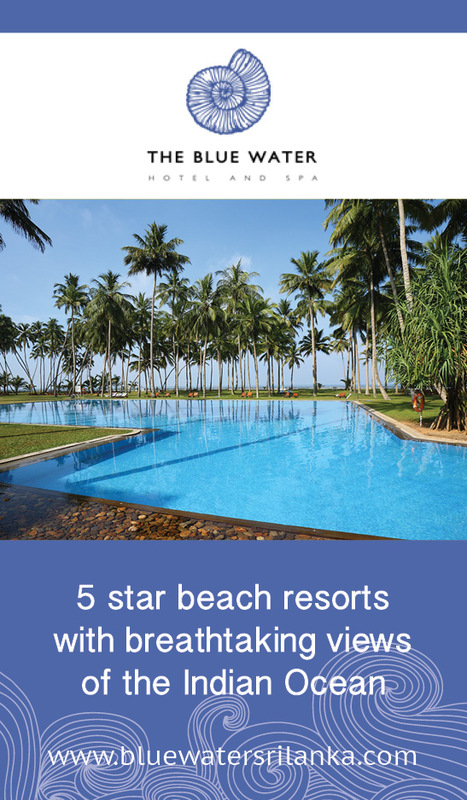 You have arrived in Chennai on the east coast of India bordering the Bay of Bengal." 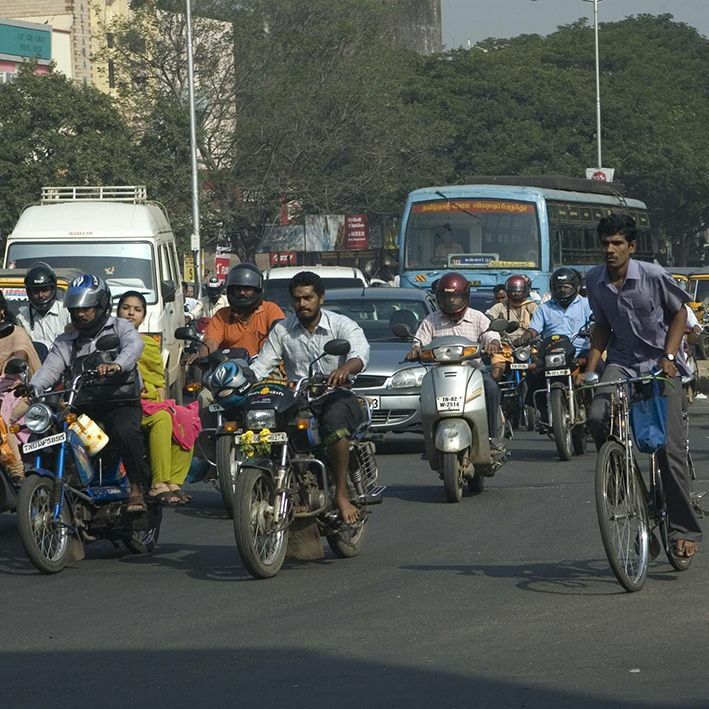 The city of Chennai, better known by its ancient name of Madras, is the capital of the state of Tamil Nadu, largest city in the country with more than 8 million inhabitants. Your driver drives you to your hotel. And, as soon as you are ready, you go for a city tour with your guide. Discover St. George's Fort, built by the British, now the seat of the Tamil Nadu Assembly. 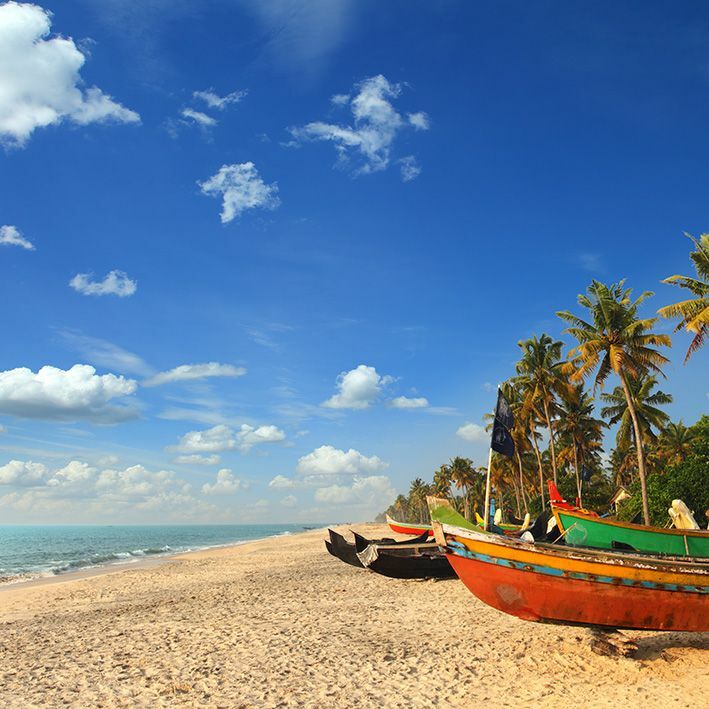 Enjoy the beach at Marina Beach, which offers a beautiful panorama of the city. Visit also the must-sees: the St. Thomas Basilica and, just next to it, the temple of Kapaleeshwarar. Finally, finish with an introduction to Indian classical dance at kalakshetra school (excluding periods of exams and school holidays). Dinner at leisure. After breakfast, leave for Mahabalipuram. This city, an ancient port of the Pallavas dynasty, dating back to the 7th century, is now a UNESCO World Heritage Site. On the spot discover the Temple of the Shore, built from 700 to 728, it is one of the first temples built (as opposed to temples excavated or excavated). Admire "The descent of the Ganges" or "The penance of Arjuna" carved in granite, the sculptures depict the course of the Ganges from the Himalayas as described in the Panchatantra (collection of Indian tales dating from the fifth century). This bas-relief, probably the largest in the world, is 27 meters long and 9 meters high. Observe the Five Ratha, monolithic monuments, shaped like floats in procession. 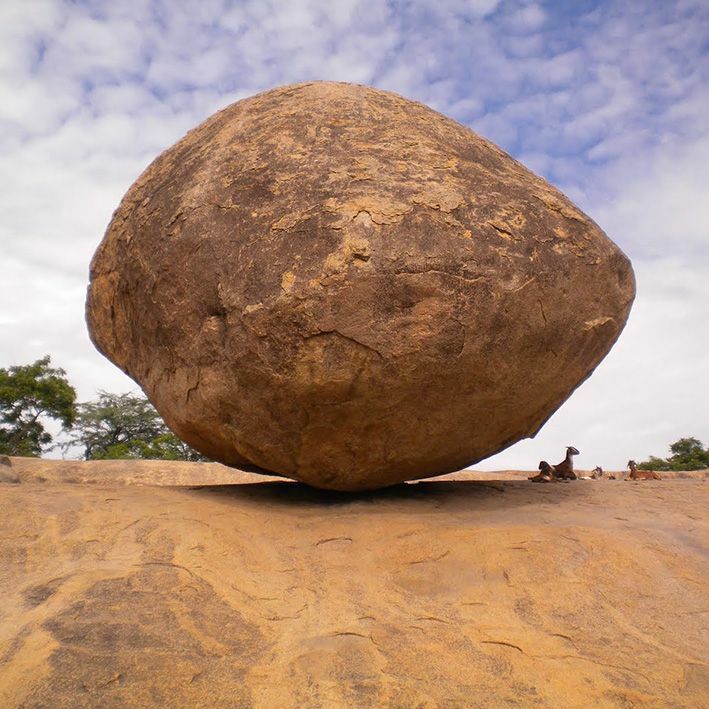 Finally we advise you to go see Krishna's ball (a miracle!) And enjoy the beautiful beach. Dinner at leisure. Departure early in the morning, after breakfast, towards Pondicherry.On the way, you make a detour to Gingee Fortress.Outside the beaten track, this fortress that can be seen from far away on his rocky mound, seems inaccessible.However, after 1000 irregular steps, one reaches a view of the valley absolutely incredible.Following this ascent you join Pondicherry, former French colonial counter. This city that was under French influence from 1673 until 1954 has a charm like nowhere else. Indeed, the city is mixed and the French heritage is visible. While strolling you will see for example streets with French names, nevertheless, Pondicherry remains an Indian city with these bazaars and its congestion... Dinner at leisure. 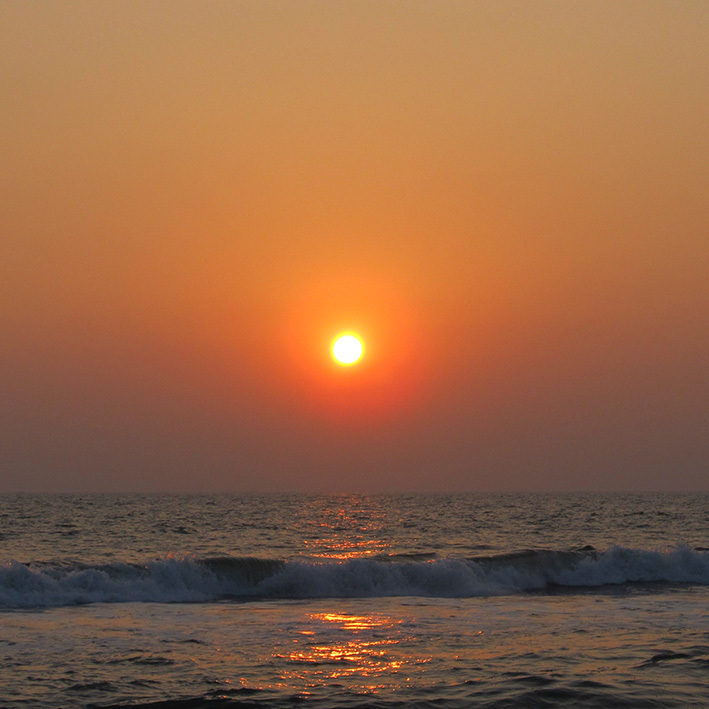 Today you enjoy Pondicherry, to the north and south of the city are quiet beaches, ideal for swimming or walking at sunrise. You can also enjoy the" Seaside Promenade ", discover the neighborhood of the governor and, why not, visit Sri Aurobindo's ashram. An ashram, in ancient India, was an isolated place where a sage lived and sought union with God in solitude and inner peace, far from distractions and agitations of the world, which was founded by Sri Aurobindo in 1926. 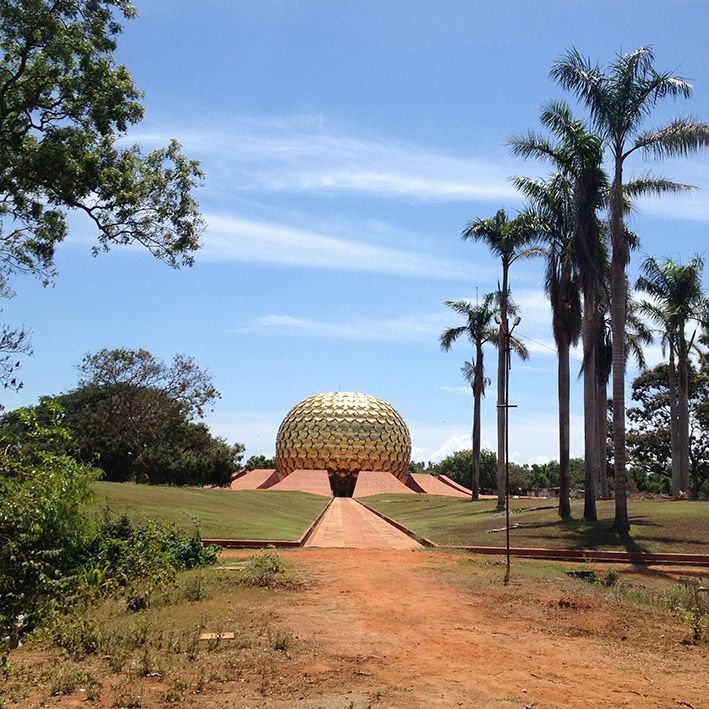 You could also make a detour to Auroville, about ten kilometers, a small utopian city whose Mira Alfassa or "Mother", companion of road of Sri Aurobindo, is at the origin. The community (or sect, according to critics) still hosts 2,500 people. Back to the hotel, dinner at leisure. This morning you will go to Tanjore, and on the way you will visit the temple of Chidambaram, where the Bharatanatyam, the famous dance of Tamil Nadu, was born, and you stop for a moment at the thousand-year-old temple of Gangaikondacholapuram. Thousands of statues in honor of Shiva, then head for Kumbakonam, known for its countless temples but also for its Mahamaham festival, which takes place every 12 years. 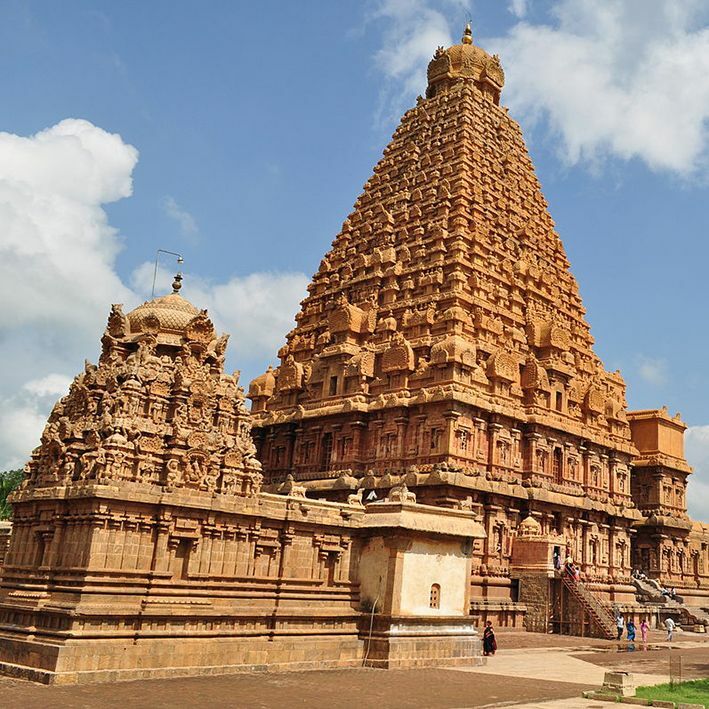 Finally, arriving at Tanjore you visit the incredible temple of Brihadishvara, erected by the emperor Chola Râjaraja between 985 and 997, a marvel of Dravidian architecture. Built in ocher sandstone, the temple looks golden at sunset. The Palais Royal Museum is also remarkable, especially for its library and its bronze and wax figurines. 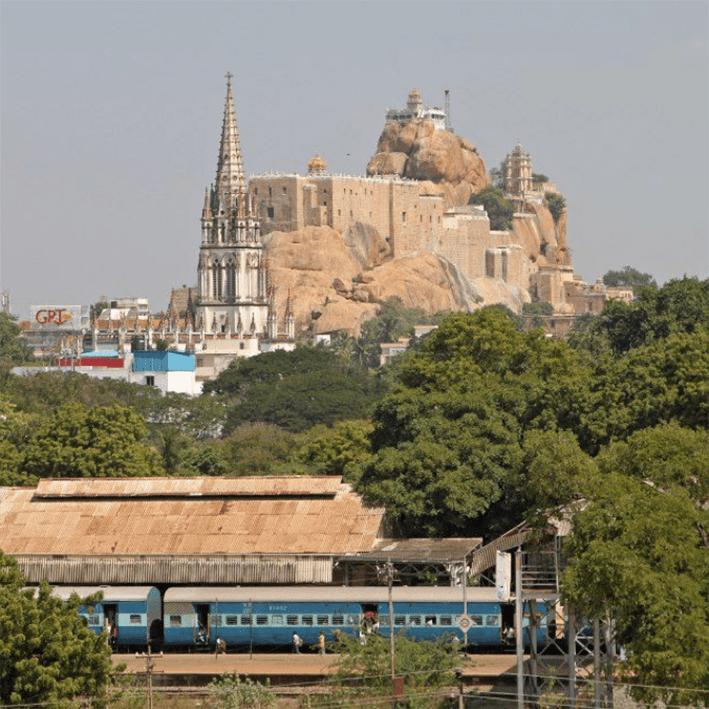 Today you go on an excursion to the city of Trichy, with two extraordinary temples, the first, the Srirangam Temple, considered the largest Hindu temple in the world still active, stands on an island. Dedicated to Vishnu, one of the three great Indian divinities with Shiva the Destroyer and Brahmā the Creator. The main attraction of the temple is the Hall of Thousand Pillars - actually 953 - which are carved from scenes of battles of yesteryear. The second temple, the Rock Fort Temple, stands on a Sacred Rock with a beautiful view of the city. You will discover it, after having mounted more than 400 steps carved in the stone. After the visit you return to your hotel in Tanjore. Dinner at leisure. After breakfast, departure to Chettinad. 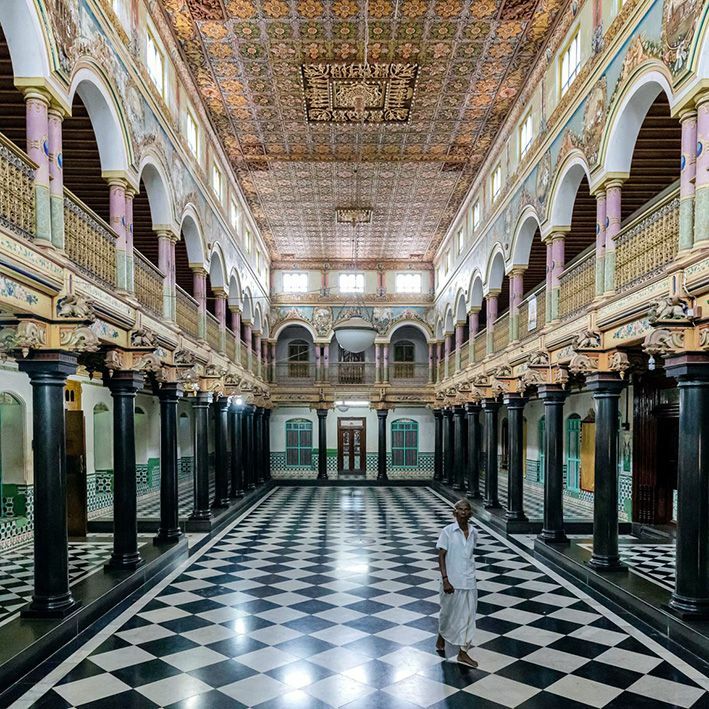 The city of Chettinad, located in the Sivaganga region in the state of Tamil Nadu, is known for its innumerable and sumptuous palaces. 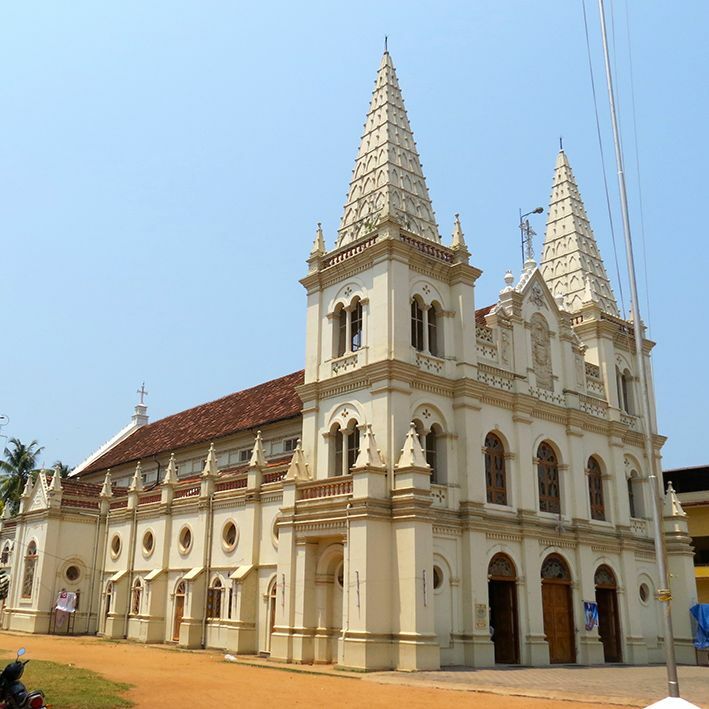 These were built by the community of Chettiars, a caste of merchants who made their fortune in the nineteenth century by trading with Ceylon (Sri Lanka) and Burma among others. Indeed, in order to show their success, the Chettiars have built sumptuous homes, adorned with materials from around the world: Burma teak, marble from Italy or dishwashing from Indonesia. Chettinad is also known for its spicy cuisine. Dinner at leisure. This morning you go to Madurai. Madurai is one of the oldest cities in India and was a major literary center during the first three centuries of the Christian era. Today the holy city, blessed by Shiva, is a high place of Hindu pilgrimage. You will most certainly see in the city some "sādhus" or "holy man", recognizable by their painted faces. A "sadhu" is a Hindu ascetic who has renounced any attachment of material life to devote himself solely to his spiritual quest. Visit the temple of Mînâkshî, a masterpiece of Dravidian architecture, where many faithful come to marry and purify themselves. The Tirumalai Nayak palace, built in the middle of the 17th century with the assistance of an Italian architect in an Indo-Moorish style, is also worth a visit. Dinner at leisure. Early morning departure to Thekkady. 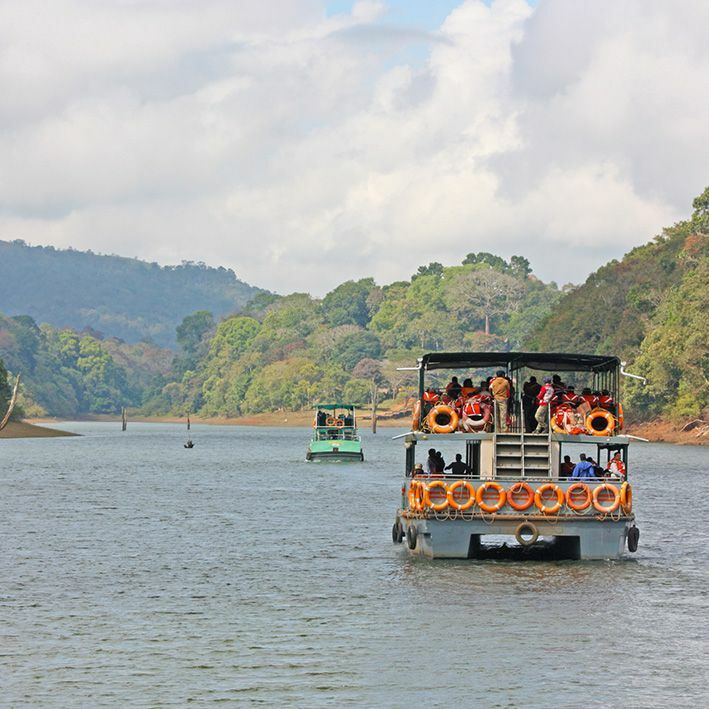 Today you go to meet the wildlife, by boat, in the Periyar National Park. Nestled in the hills of "Western Ghats", the altitude of the reserve varies between 900 and 1800 meters. From your boat you will most certainly see pachyderms, and, if you are very lucky, one of the 40 tigers in the area. In the afternoon you spend some time in contact with an elephant, you can make him take a bath and walk by his side. Then enjoy the free time to discover the market of the city which is full of spices of all kinds. Finally, at 18h, attend a demonstration of kalaripayattu, Indian martial art (1h). Dinner at leisure. Today you take the road towards the peninsula of Munroe Island. 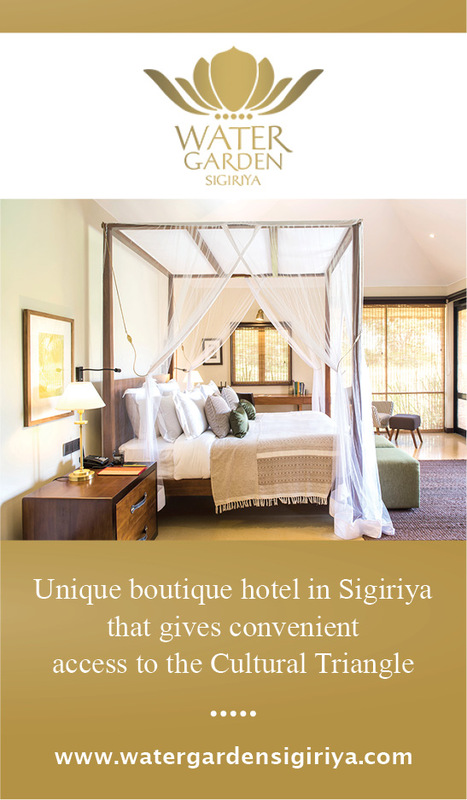 It is a pleasant, calm and relaxing place to discover by pirogue. 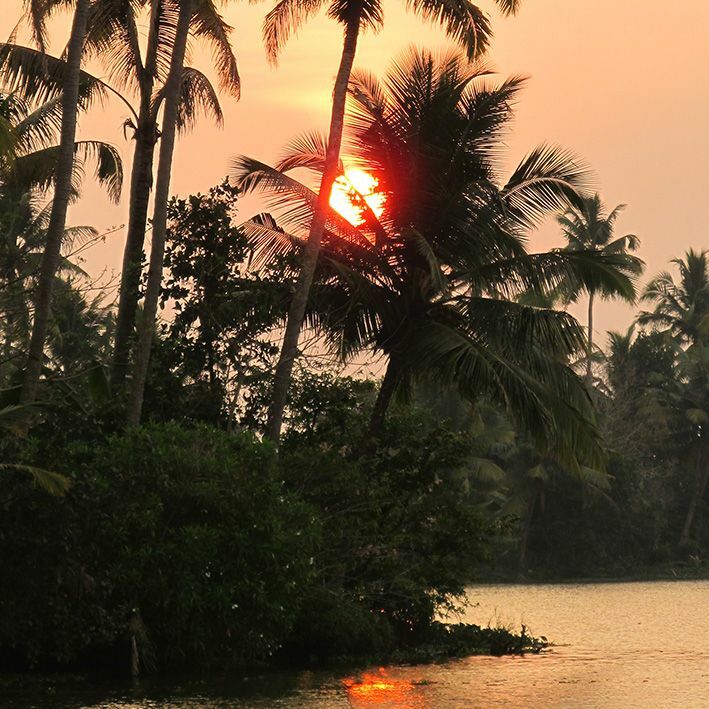 Indeed, the peninsula is lost in the "Backwaters", a series of lagoons and brackish water lakes parallel to the sea and interconnected by both natural and artificial channels. The Backwaters represent more than 1500 km of waterways including several large lakes including Ashtamudi and Vembanad. In the afternoon, once settled in the hotel, you go for a walk of 3 hours in the middle of narrow channels. On board your authentic boat, you sail under the coconut trees in a serene atmosphere. At the rhythm of the perch of your guide, you admire pretty little villages and the green surrounding nature. Dinner at leisure. Today you go for a cruise on a traditional houseboat, privatized. Welcomed by the crew, you enjoy the panoramic view offered by this real "house-boat", comparable to our barges. By navigating the canals, the lagoons and the lakes you will enjoy the incredible landscapes of Kerala which pass before your eyes. You will see vast green rice fields and picturesque flower villages of hibiscus and bougainvillea. Also on the banks you will see, in front of ancient teak houses, real scenes of daily life; fishermen, children, housewives washing clothes ... Finally, as you travel, you may recognize some endemic plants and animals, many in the region. Indeed, the geographical variety and the climate explain the important biodiversity of Kerala. 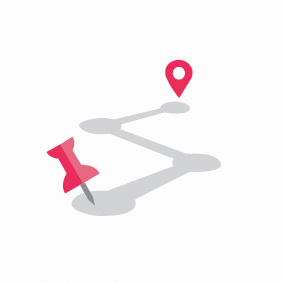 Following the cruise your driver will take you to your hotel. Dinner at leisure. After breakfast, departure for the beach of Mararikulam. This paradise beach, peaceful, is ideal for a day "lazy" a few days of your return. Here no buildings that distort the landscape and few tourists, only local fishermen with wide smiles. Enjoy your day in the shade of palm trees and taste a freshly squeezed pineapple juice or coconut water facing the Indian Ocean. And especially open your eyes, dolphins could go off! Dinner at leisure. This morning you take the road to Kochi, or Cochin. 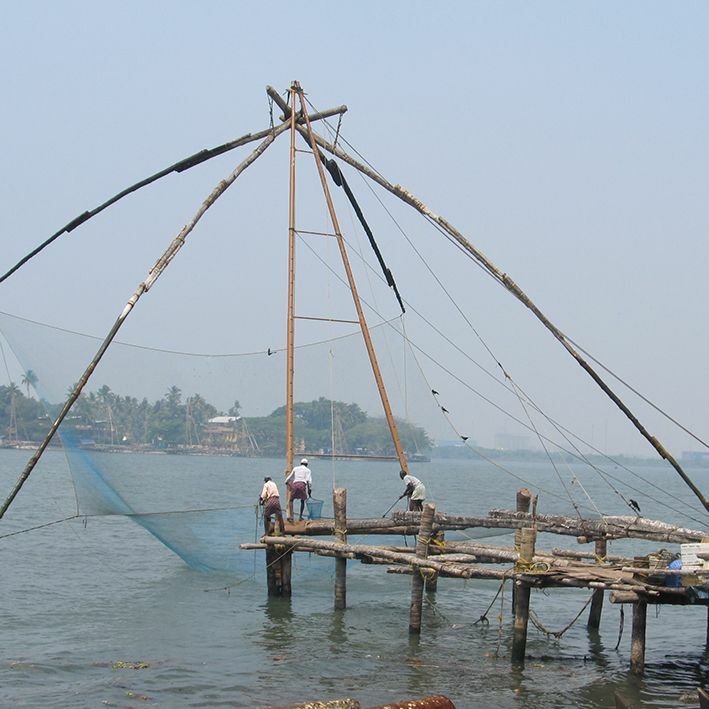 On site you start by visiting the fishing port to go see the "Chinese nets". Well known, these "nets" have a sophisticated system of pulleys and rockers that allow up and down fishing nets. They are part of the Chinese expedition of Zheng, who passed through Kerala in the fifteenth century, before the arrival of Europeans. Then you go to discover the city, a true example of cultural diversity, through its different peoples who have colonized the city over history, and all the communities and religions that coexist today. Finally, in the evening, you go to the theater to see a Kathakali dance-theater show. 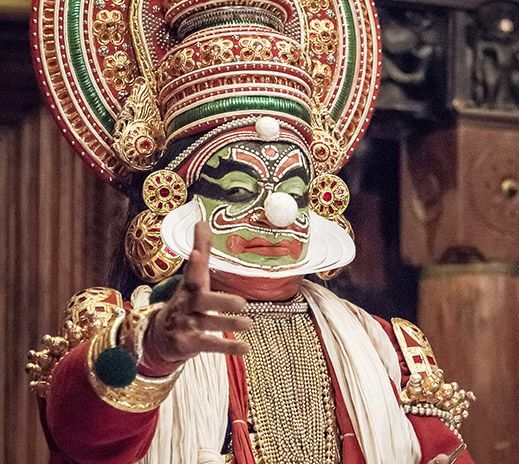 This famous Indian classical dance, originally from Kerala, is known for its sumptuous costumes and the incredible makeup of actors (always men). 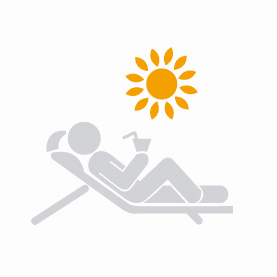 Leisure day with car available. 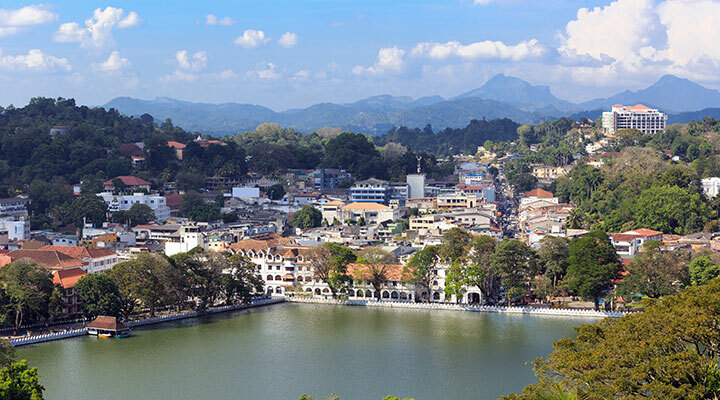 This gives you time to discover Cochin and its rich history. Indeed, the city was for centuries one of the most important ports in Asia for the spice trade. After the passage of the Chinese in the fifteenth century, Cochin was a strategic point for the near Arab populations and for the European colonies -Portuguese, Dutch, English- from the sixteenth to the eighteenth century. As you walk through the alleys of the Fort, the historic heart of the city, you discover the footprint of different populations. The oldest church in the country and many mosques. The palace of Raja, often called "Dutch Palace" which was built around 1555 by the Portuguese and later redeveloped by the Dutch. The synagogue dating from 1568, when many Jews found refuge in India following the persecutions that already bloodied their land. 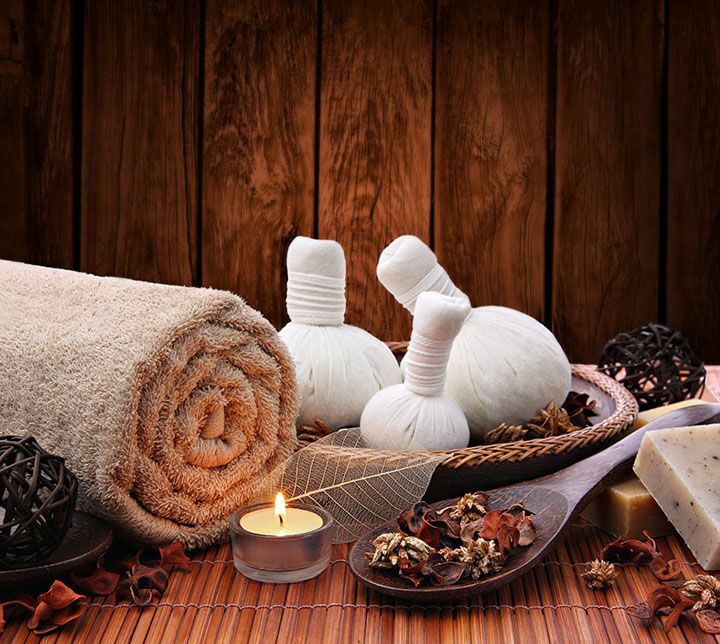 Depending on the time of your return flight, you still enjoy a bit of the city of Cochin where you could test, why not, a traditional Ayurvedic massage. Then, your driver drives you to the airport. We hope that your stay in South India will have met all your expectations and wish you an excellent return!